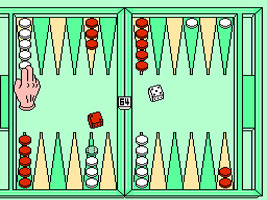 A computer version of the Backgammon tabletop game. The aim is to move all of your pieces to a specific corner of the board by rolling two dice. When your pieces are alone they can be captured, and must wait in the middle until they can make a move from the starting corner. There are various modes to play, including a full tutorial, VS. and Tournament modes.